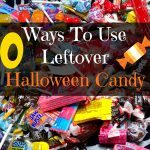 After writing last weeks post about leftover Halloween candy and taking my kids to our local trick or treat on main street where they collected a ridiculous amount of candy I couldn’t wait to try out some fun ways to use it up. 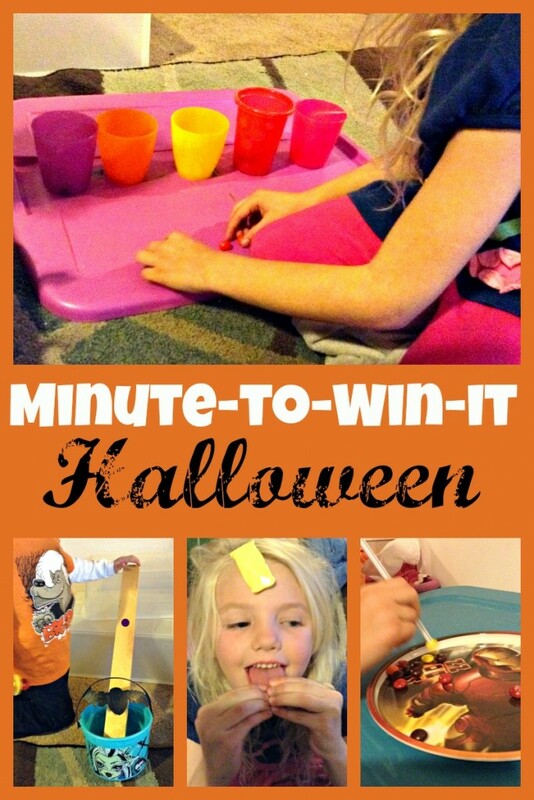 So this week for our weekly family night activity we competed in a minute to win it style competition using various candies. My big kids had a blast trying to race each other and the clock to complete the events. 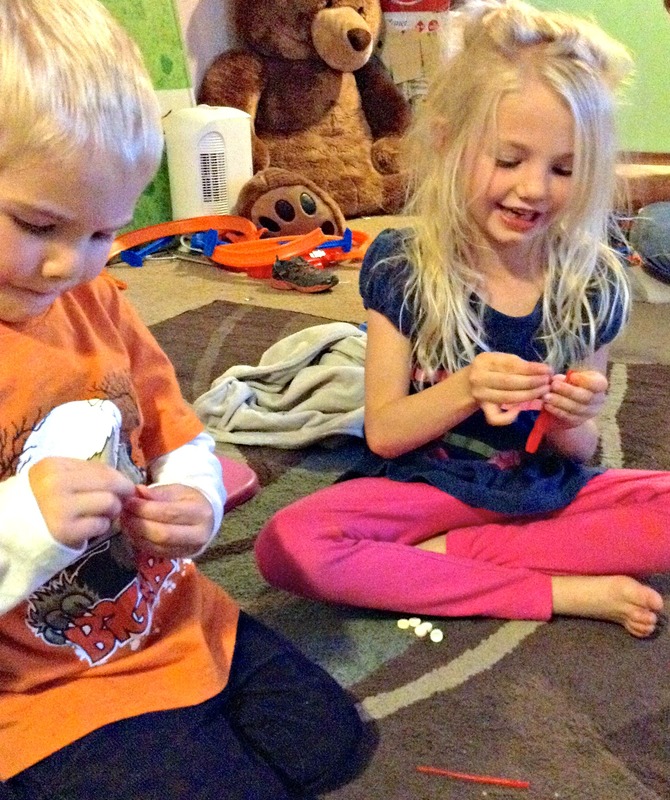 In our home “big kids” refers are anyone one over the age of 1 and under the age of six. So the games had to be fairly simple so they could actually accomplish the task at hand without becoming terribly frustrated. However, the games would be easy to adapt and make harder for an older group. Here is a wrap up of the games we played. This game was easy and fun to play. 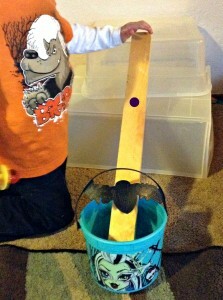 We propped up a piece of wood diagonally and placed the end in a Halloween bucket. I set the timer for a minute and the kids took turns seeing how many jawbreakers they could get to roll down the ramp into the bucket. To make this game harder for older children you could use a longer or more narrow piece of wood. 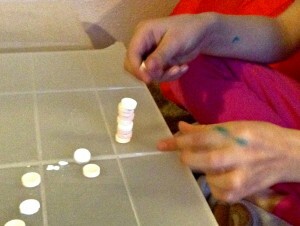 In this game, the kids competed against each other to see who could stack the most smarties on top of each other in 60 seconds. If their tower fell down they could start over and build again until time ran out. To play this game I gave each child a pull and twist Twizzlers and the task of pulling apart all strands before the minute ran out. 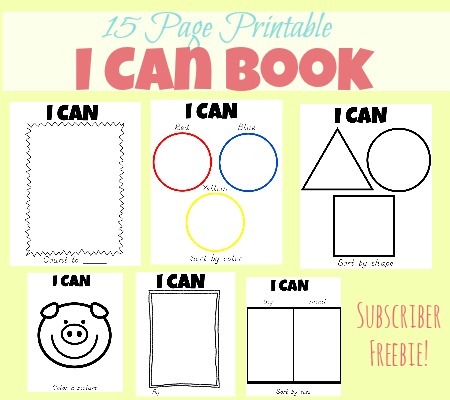 This game was very easy for my five-year-old, but challenging for my three-year-old. If we did it again I would give my daughter two Twizzlers and instead of just having her finishing the task I would have her count how many pieces she pulled off in the minute to make it more challenging. 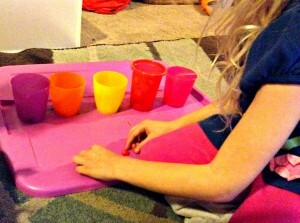 In this game, the kids raced the clock to sort the colored candies into the matching color cup. 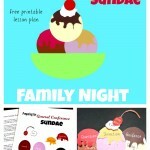 This game was fun for my children and especially great for my preschooler who is still learning color recognition. 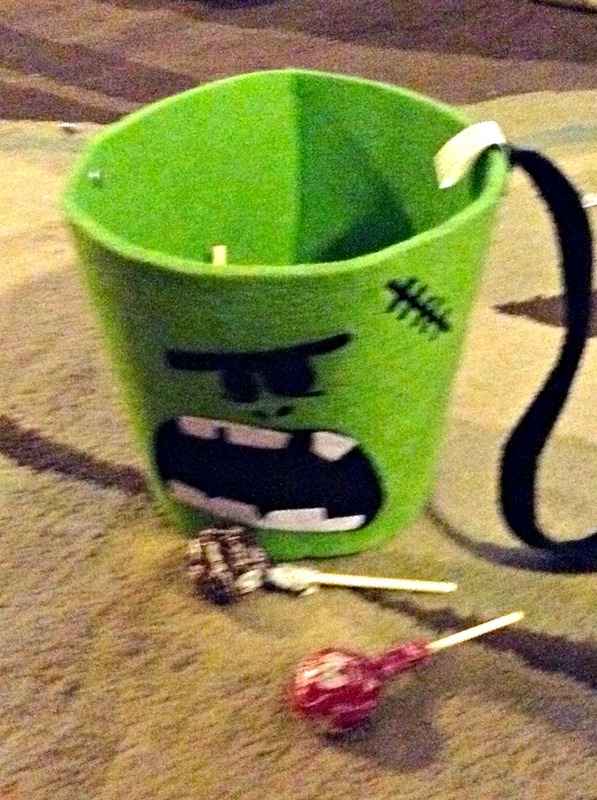 Plus, you can make it harder or easier for different age players by adjusting the number of candies they must sort. This game was easy to set up and play. The point of the game was to see how many lollipops they could get into the bucket in a minute. It was easier to change the difficulty of the game for their skill level as well by changing the distance they had to throw from. I believe this might be an official minute to win it game. Honestly, I don’t watch the show, but I’ve seen this idea around quite a bit. You use a flexible straw to move candy pieces from the table to a plate. 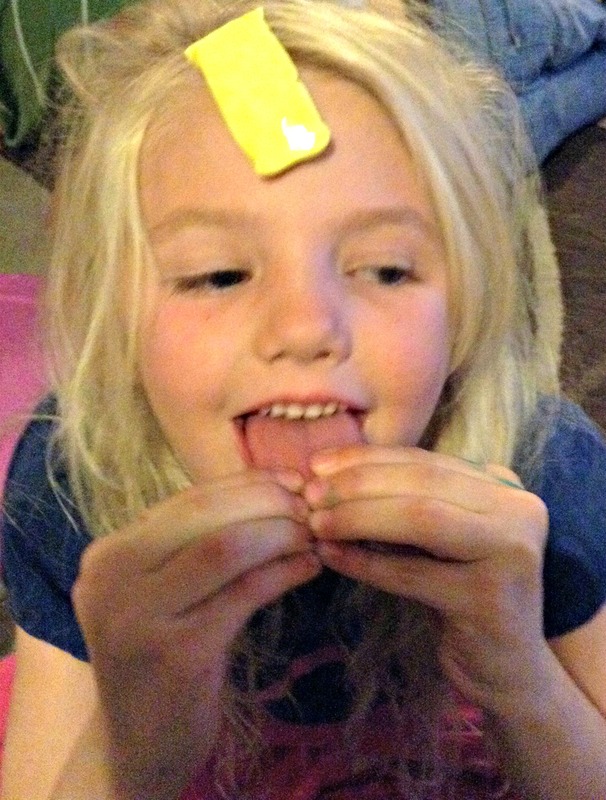 It took my five-year-old a few tries to get the hang of it, but eventually, she did and got quite good at it. 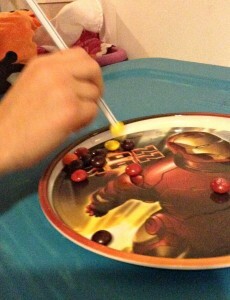 Just make sure you have candies for each player because there was a little spit involved. Honestly, I’m not even sure if it is possible to win this game. The purpose of the game is to get the taffy from your forehead to your mouth without using your hands. The original challenge uses a cookie and can be done.The taffy seems to be quite a bit harder because it is slick. After watching my kids try several ways to accomplish this I tried it myself and couldn’t figure it out. However, I would play it again because it sure was fun to watch them try and get it. 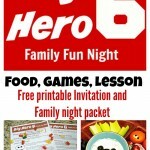 All in all, it was a fun and easy family night. Set up was minimal and the kids are already asking to do it again. Do you have any fun games using candy? I’d love to hear your ideas please comment and let us know.